Tickets on sale to the public on Friday, August 24, 2018. Charlottetown, August, 2018 -- Unique Lives & Experiences is proud to present an Evening with John Cleese, on Thursday May 9 at 7:30 PM as he examines the dysfunctional world we live and “Why There is no Hope”. Tickets go on sale Friday August 24 at 10am and can be purchased on line at www.uniquelives.com. Prices range from $55-119*. 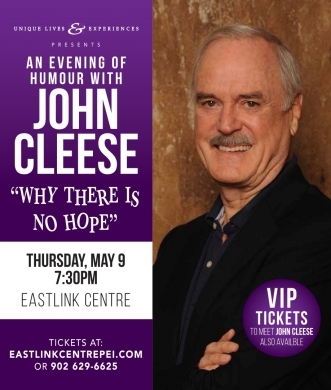 VIP tickets to meet John Cleese are also available. Come spend a hilarious evening with the “One and Only” John Cleese. John is a legendary comedic actor best known for: “Monty Python’s Flying Circus”, “Fawlty Towers” and “A Fish Called Wanda”. “The world’s funniest man” first made his mark as a member of the legendary Monty Python troupe in the 1960s and has gone on to write, produce, direct and star in some of the greatest comedic hits of the last forty years, even receiving an Oscar nomination for best screenplay for “A Fish Called Wanda”. But John is far from your garden variety entertainer. From the beginning of his career he has continually parlayed his enormous talents into advancing the political causes he believes in. Tickets booked online or over the phone subject to additional fee.